Bookkeeping focuses on the recording and processing daily financial transactions such as purchases, expenses, sales and receipts. This is a daily record keeping activity that is the basis of all the financial reports. It is very important to keep an up to date, accurate and true record of all the transactions. Companies use different accounting software like Sage, QuickBooks, Xero and excel spread sheets to record these transactions. 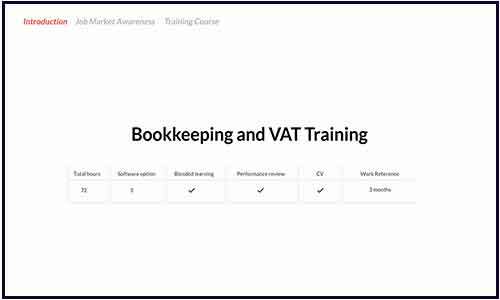 Getting comfortable and accustomed to accounting software is an important step towards gaining a job role as bookkeeper. The course is suited for aspiring bookkeepers, and anyone who wants to start a career in accounting. Learning knowledge and Training on Sage 50 Navigation and other software. Sage 50 helps you to learn and create a new company data file. Makes you to learn and identify the needs of the company. Implement the discussion on template. Its Software is being configured and based on identified company needs. Sage 50 makes it easier to work with as it divides the whole fiscal year into a number of accounting periods. Makes you learn how to identify and choose a correct accounting period and know how to modify the system date in Sage 50. Generating and updating invoices, purchase orders, quotes and credit notes for customers. Extracting the reconciliation of customer account activity. Recording customer receipts & carrying out the aged debtor analysis. Introduction to various important VAT industry specific issues for Retail , IT , Construction industries. For better understanding on how to the work on VAT regular workshop has being introduced.